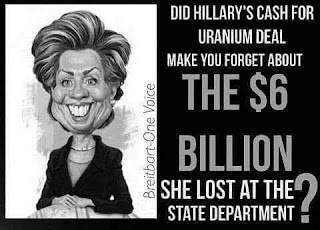 How many people were 'focused' on the Uranium One scam where Hillary & Co 'sold' 20% of America's uranium to Russia for fun and profit? How many more people have been 'distracted' and completely forgotten about the $6 billion Hillary's State Dept "lost" and/or "misplaced?" Putting Hillary near money is akin to having Hannibal Lecter in your kitchen.